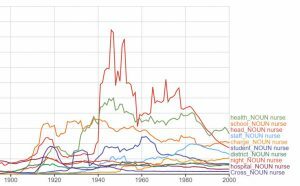 I don’t have an easy answer, but here are a few ways to search Ngram Viewer. Leave a comment and let me know what you’ve been able to do with this intriguing research tool. Compare the relative popularity of concepts over time. 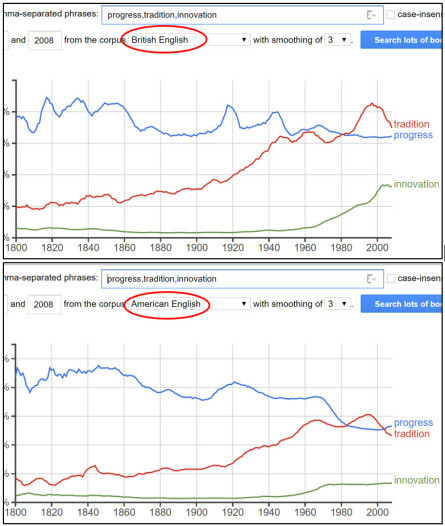 For example, you can compare the frequency of the words progress, tradition and innovation over the decades. To make this more intriguing, note the different results when you limit your search to British English or American English. Search for any word that appears near a specific word. If, example, you were researching the nursing profession, you might want to see what words most commonly precede the noun “nurse”. 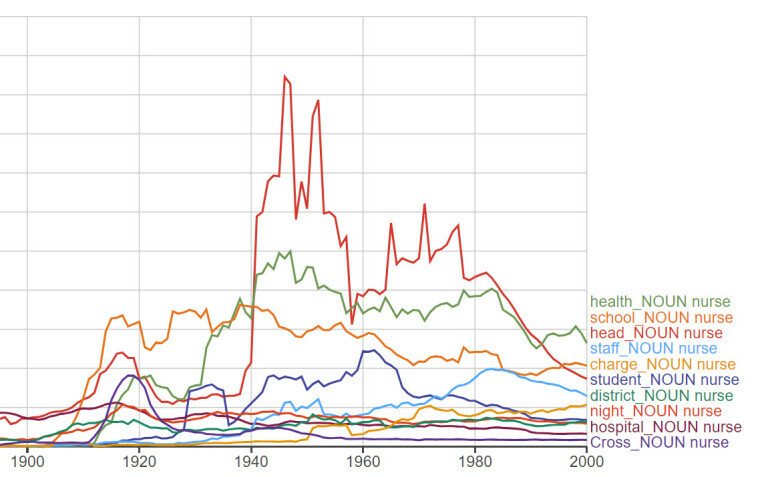 Using the syntax *_NOUN nurse, you can note the spike and subsequent drop in frequency of “head nurse” in the middle of the 1900s. Compare the prevalence of a concept in fiction against all English-language text. If you want to see how frequently doctors and nurses are mentioned in fiction, the query nurse:eng_2012,nurse:eng_fiction_2012,doctor:eng_2012,doctor:eng_fiction_2012 will show you that doctors get the most press. Granted, the syntax requires you to channel your inner programming nerd, and it takes some creativity to figure out how to use the Ngram Viewer. If you want to dig even deeper into all of its capabilities, check out the advanced search page.